Smooth Pinot Noir is great on its own and with food from pizza and wings to holiday turkey dinner. More than a decade ago, the hit movie Sideways threw a spotlight on Pinot Noir, and Americans have been head over heels for the velvety wine ever since one of the film’s characters spurned Merlot for Pinot. 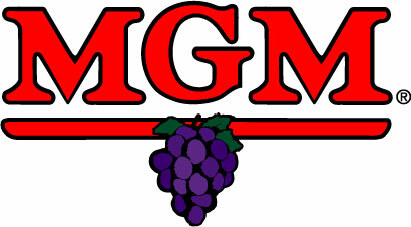 The Pinot Noir grape originated in France’s Burgundy region, one of the world’s most famous wine growing areas. This grape, which is finicky about where it sinks its roots, flourishes in Burgundy’s cooler climate and produces wines of note that can fetch thousands of dollars. There are also delicious offerings labeled with the general regional “Bourgogne” that offer more affordable options. Domestically, California and Oregon produce Pinot Noir so delicious it gives French Burgundy a run for its euro. 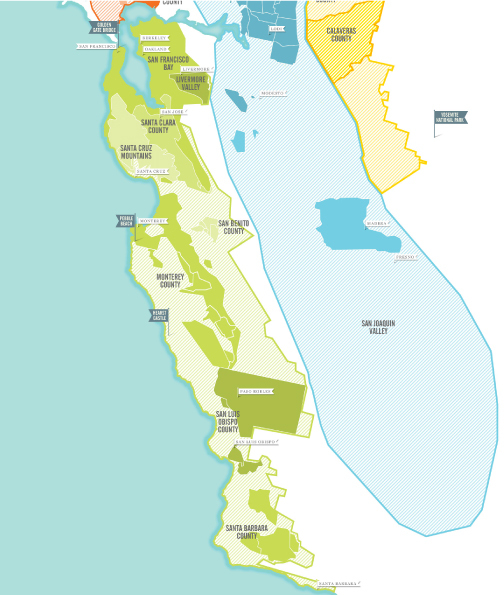 Some of the United States’ most esteemed Pinots come from the large section of California known as the Central Coast, which stretches south from San Francisco to Los Angeles. Some names you will see on these wines include the counties of Alameda, Monterey, San Benito, San Luis Obispo, Santa Barbara, Santa Cruz and many areas in between. Inland a bit, the Russian River that snakes through Sonoma County is responsible for the chill that makes the Russian River Valley a premier Pinot region as well. Oregon has just the right conditions to make great Pinot Noir. Its temperate climate, combined with coastal marine influences, make the gentle growing conditions within the Willamette Valley ideal for cool climate grapes such as Pinot Noir. Lighter in body and color, Pinot Noir is less tannic than Cabernet Sauvignon, Merlot and Syrah. White wine devotees should also enjoy Pinot Noir’s silky medley of flavors that can range from black cherry, raspberries and plum to anise, cedar, fresh earth and more. 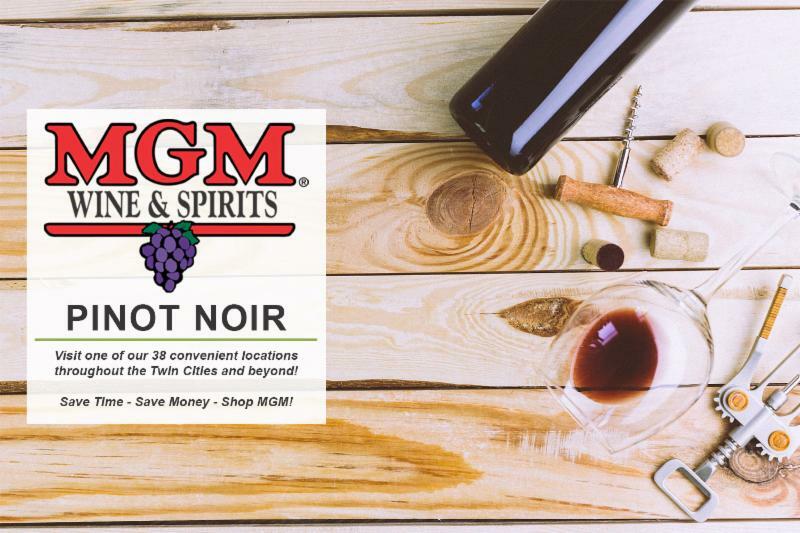 Oregon Pinot Noir spans the flavor spectrum between red and black fruit, frequently accented by a pronounced spiciness that suggests cinnamon, sassafras or mint. They are usually fresher with higher acidity and often more intensely fruity notes. Researchers studied the “Sideways Effect” as a result of the movie of the same name and found the positive impact on Pinot Noir appears greater than the negative impact on Merlot: While the sales of Merlot slowed slightly following the movie, sales of Pinot Noir increased significantly. California’s Central Coast from San Francisco to Los Angeles produces delicious Pinot Noir, including Santa Barbara, which has long been a favorite hideaway for movie stars, from Charlie Chaplin to Jane Russell, Nick Nolte and Oprah Winfrey. Considered one of the most food-friendly reds, Pinot Noir pairs well with cheeses such as Emmental, Gruyère, Brie or Roquefort, and meats such as beef, grilled or marinated poultry, lamb and pork. The subtle earthiness perfectly matches with mushrooms, while the wine’s dry fruit flavor complements the richness of salmon. 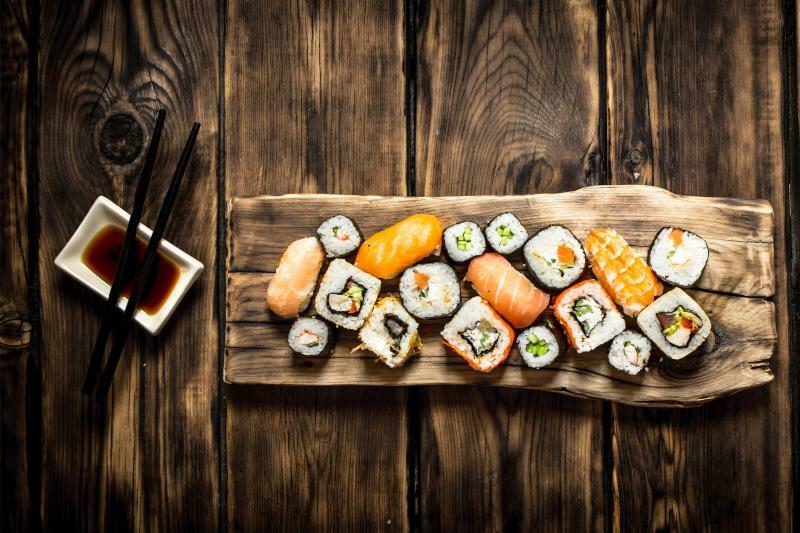 Other flavorful seafood is also a good pairing: roasted sea bass and sushi made with red-fleshed fish such as tuna also work well with this classic red. It’s also a tasty match with pizza and spaghetti and meatballs in a rich marinara sauce as well as other dishes from a juicy cheeseburger to grilled salmon or Thanksgiving turkey dinner with all of the fixings. On a floured surface, roll pizza dough flat. Place dough on a flour-dusted pizza peel, oil grill grates, and transfer dough to the grill. Cook for 3 minutes on each side, then remove from grill back to pizza peel. 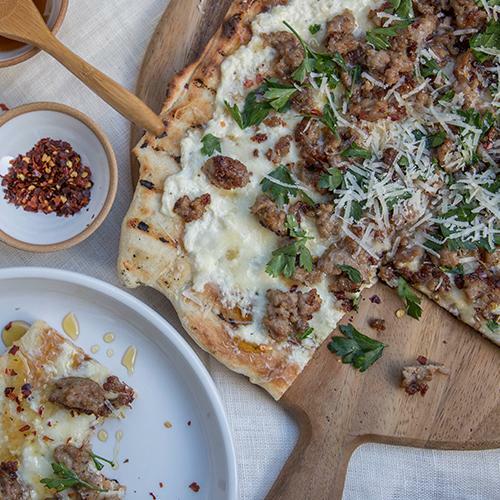 Spread ricotta evenly all over the pizza dough, leaving a ¼-inch border. Sprinkle the mozzarella, sausage and chili flakes evenly. Return to the grill for 3 to 4 minutes or until all cheese is melted. Drizzle honey in zigzag formation across the pizza. Sprinkle with parsley and Parmesan and serve. Add all dry ingredients to the bowl of a stand mixer and mix on low to combine. While the mixer is running, add the olive oil then water and beat until the dough forms a ball. If it is still sticky, add 1 tablespoon of all-purpose flour at a time until the dough forms a ball and is no longer sticky. Turn the dough out onto a floured surface and knead into a firm ball. Spray a medium bowl with non-stick spray, add the dough and cover with plastic wrap. Leave at room temperature for 1 hour. Turn the dough out onto a floured surface and divide into 4 equal balls. Cover each piece with plastic wrap and leave to rest for 10 minutes.